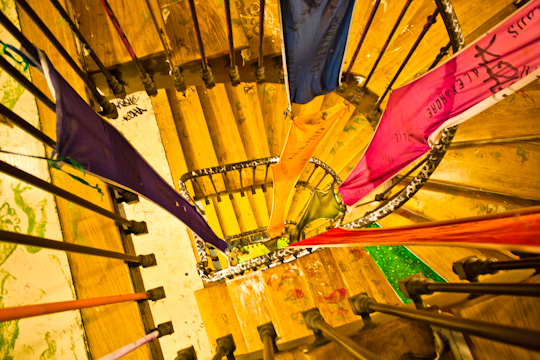 Paris Weekender - Meet the Artists at the 59 Rivoli Aftersquat! Meet the Artists at the 59 Rivoli Aftersquat! You may have noticed the intriguing decorations on the facade of the 59 Rivoli Aftersquat or perhaps you caught the acrobatic show on Nuit Blanche or one of the many concerts that can be heard from the street. Next time you pass by number 59 rue de Rivoli in the 1st arrondissement, just 150 meters west of Châtelet, it’s time to go inside! 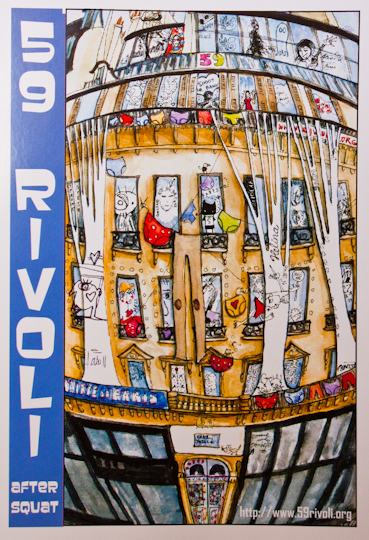 I was first introduced to 59 Rivoli by my friend Linda McCluskey, who is now a permanent resident artist with a studio on the 6th and top floor. 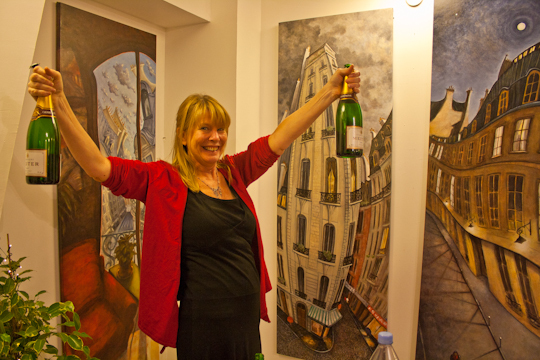 Linda creates vibrant paintings including my favorites from her “distortion series”, captivating street and rooftop scenes of Paris. Linda was also kind enough to create the logo for the Paris Weekender website! 59 Rivoli is a collective of 30 artists’ studios (20 belonging to permanent residents and 10 for temporary residents) that is open to the public year-round, Tuesday through Sunday from 1PM to 8PM. You do not need reservations (although large groups may want to call ahead just to give the studios a heads up), nor is there an entrance fee (although donations are welcome). You do not need to be an artist yourself, just walk in! On the ground and 1st floor is a gallery housing temporary exhibits, concerts every Saturday afternoon and frequent special events. 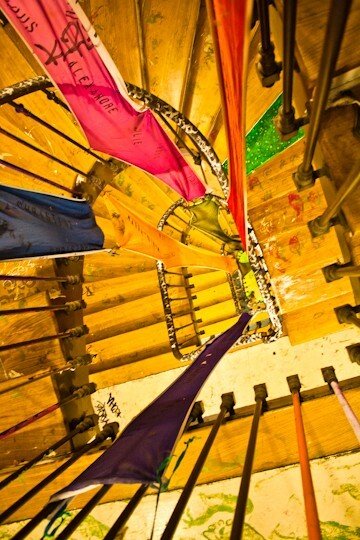 This artists’ collective started as a squatters’ quarters in 1999 an abandoned bank building and was purchased by the city of Paris in 2002, marking the start of a partnership between the artists and the city. Now, the studios receive approximately 1500 visitors each week. I admit that I do not like all the art I see at 59 Rivoli. Some works I would put up in my living room in a heartbeat, whereas others are just too “out there” for me. But what makes 59 Rivoli unique is the welcoming atmosphere, both for artists and for visitors. 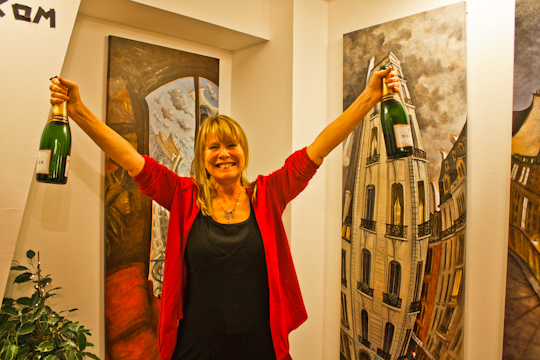 The collective strives for a diversity of artists, in terms of nationalities, mediums, styles and experience. And one essential criteria in selecting artists for the 59 Rivoli studios is that the artists must be friendly, interested in exchanges with the other artists, enthusiastic about sharing their work and happy to answer questions and engage in conversations with visitors. but I can guarantee a warm welcome! This may be deemed the 3rd most important center for contemporary art in Paris, but it is not a museum. 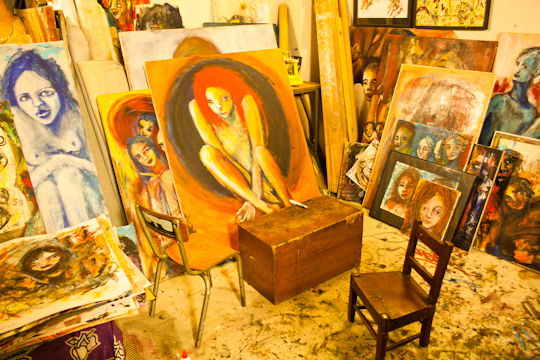 These are working studios and the interactions among artists and between artists and visitors is what makes it special. So stop wondering, “What is that building with weird facade?” and walk in!